Heading out from Castro this excursion leads to the Coipomo area to visit an agro-ecological farm conceived with the purpose of recovering Chiloe’s traditional agricultural biodiversity. The tour continues along the path of the Chepu River with its unique landscape of forests that sank during the 1960 earthquake (to date, the most powerful recorded earthquake in history). 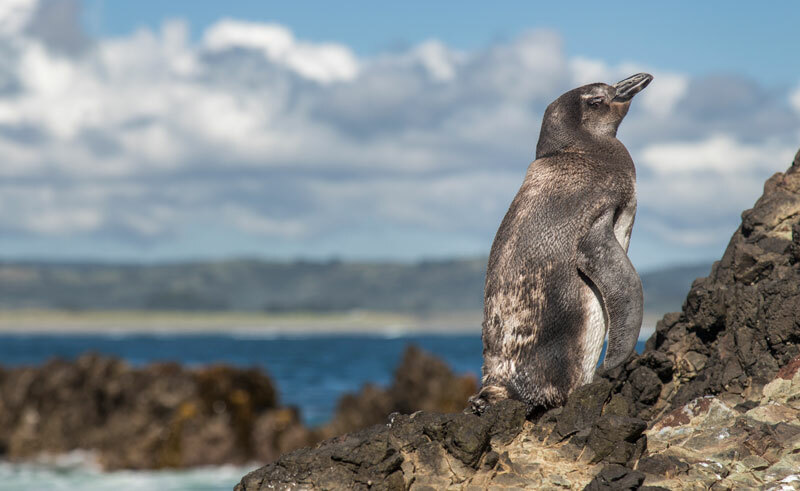 From the secluded fishing village of Punihuil Bay, join a boat trip to three isles that host a unique ecosystem, in which two types of penguins cohabit – the Magellanic and Humboldt. Then the boat ride takes visitors on a trip to observe other marine species including otters, Carancas, cormorants and sea lions. After the visit, there will be a pause at the city of Ancud, where the former Convent of the Immaculate Conception will be visited to observe the restoration work carried out by the “Friends of the Churches of Chiloe” Foundation.